right out of your home, office, and life! 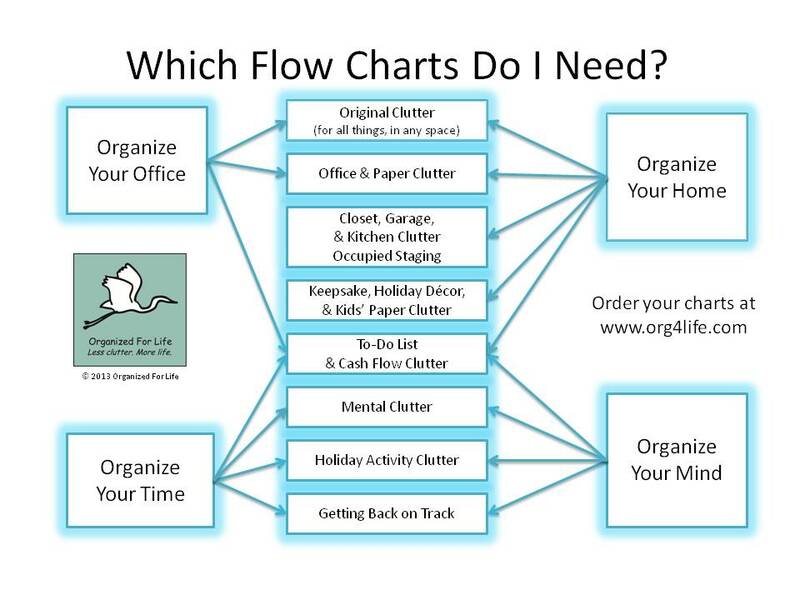 Each chart is now available as an entire individual Go With The Flow! module. A module consists of a single flow chart of your choice, companion article, worksheet, click-able resources, and instructions for use. Your link for downloading and saving your 11-page PDF file will be delivered directly to your email inbox. 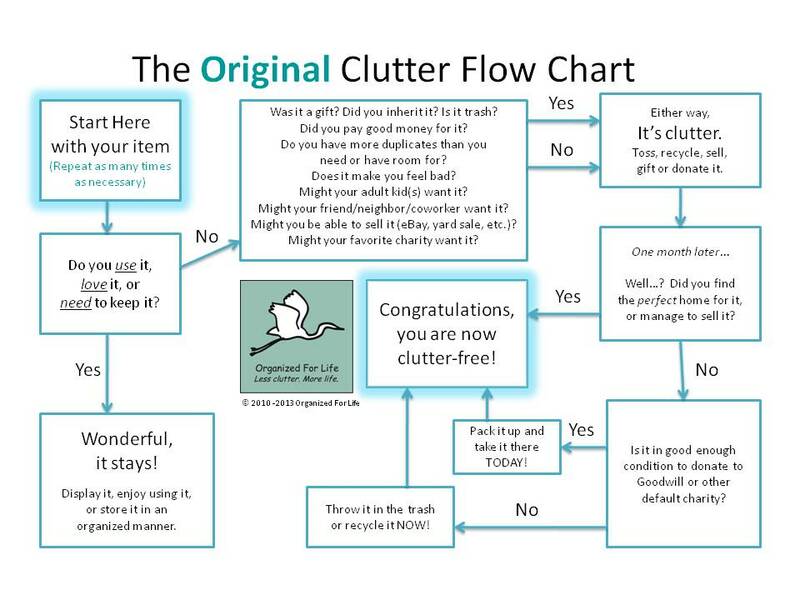 ♦ Original Clutter – Want to declutter but don’t know where to start? Just follow the arrows and take it one step at a time! ♦ NEW! Ancestry Clutter — Do you know which ancestry clues to merge with your tree, and which to ignore? Let’s take the mystery out of your family history! ♦ NEW! Photo Clutter – Can you find the photo you want, when you want to share it? Start by purging duplicates and choosing your favorites. ♦ Cash Flow Clutter – Are unresolved financial issues blocking your cash flow? Get unstuck and get back in the black! ♦ Kitchen Clutter – Not enough counter space to prepare dinner? Let’s make mealtime a pleasure again. ♦ Office Clutter – Is your desk buried in papers? Take back your valuable creative and productive work space! ♦ To-Do List Clutter – Does your to-do list never seem to get to-done? It’s all about your goals and priorities. ♦ Paper Clutter – Are mystery piles driving you crazy? You just need a reliable system for dealing with paper. ♦ Kids’ Paper Clutter – Are you drowning in artwork and schoolwork? Learn what to toss and how to display and store the treasures. ♦ Holiday Activity Clutter – Do you want to enjoy family gatherings and holidays (all of them) again? The key is to simplify. ♦ Holiday Decor Clutter – Are you storing more holiday decorations than you will ever use? Out with the old, in with the new! ♦ Occupied Staging Clutter – Are you trying to sell your house while still living in it? This chart will help you get a quick sale at top dollar! ♦ Closet Clutter – Can’t find your closet floor, much less something to wear? Clearing clutter makes getting dressed fun again! ♦ Getting Back on Track – Have you been derailed by life events and can’t seem to get caught up? Let’s get you back on track! ♦ Keepsake Clutter – Do you feel guilty parting with memorabilia? Learn how to honor what you keep, and how to part with the rest respectfully. ♦ Mental Clutter – Worried? Anxious? Fearful? Guilty? Stressed? Clearing mental clutter will give you peace of mind, and help you sleep better, too! ♦ Garage Clutter – No room to park your car? This chart will help you protect your investment and make your space more user-friendly. 15 Flow Charts?! How the heck do I decide?! The choice of 15 charts can be overwhelming! Which charts do you really need? Well, it depends… what would you like to work on next? Your Home? Your Office? Your Time? Your Mind?